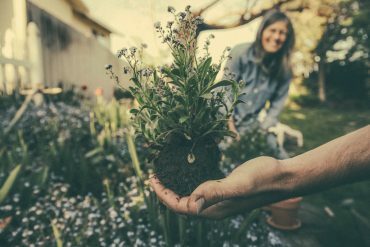 Christmas is the perfect season to showcase your creativity and show off the beautiful garden that you’ve been working on since the beginning of the year. 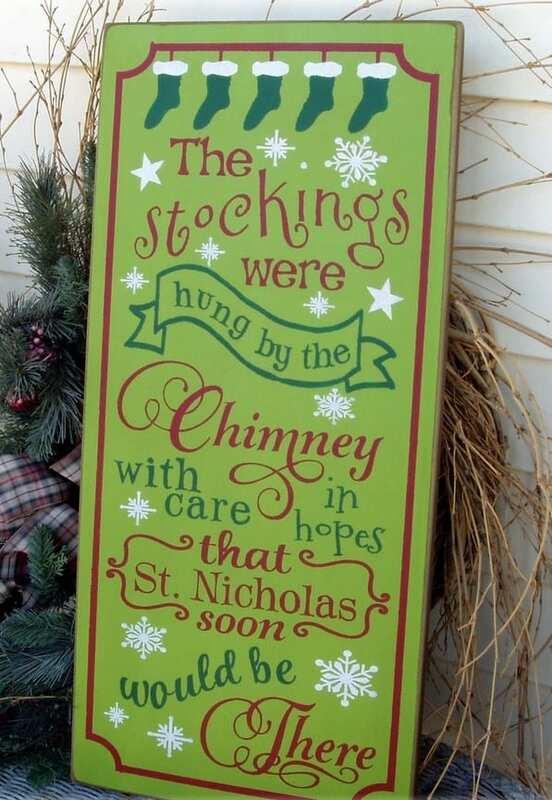 Decorating the house for Christmas is one of the most exciting things to do during this festive season. Most people forget to deck the garden. But, that’s not us! There’s no way we’ll let our garden to be left out. After all, Jesus was born in the manger, in the cold and with different animals around – not in a fancy home or inn. 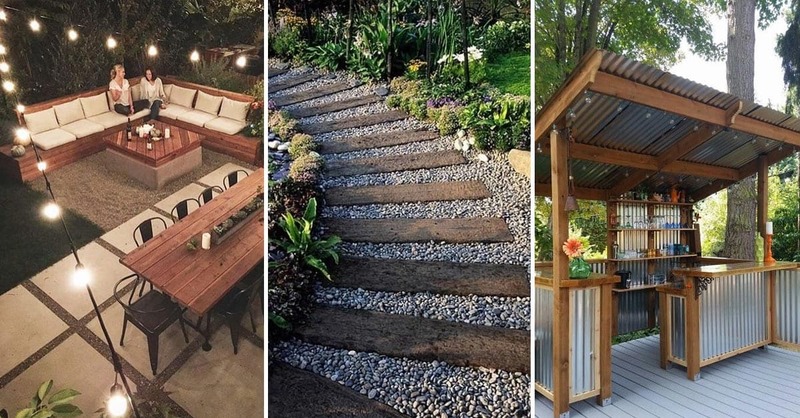 Don’t you think it just fits to make the season extra special in your garden? 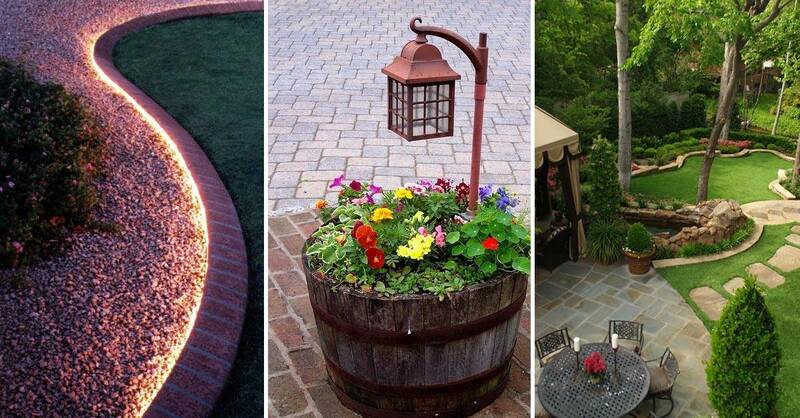 Here’s a list of ideas to level up your garden this Christmas and achieve the magical look. 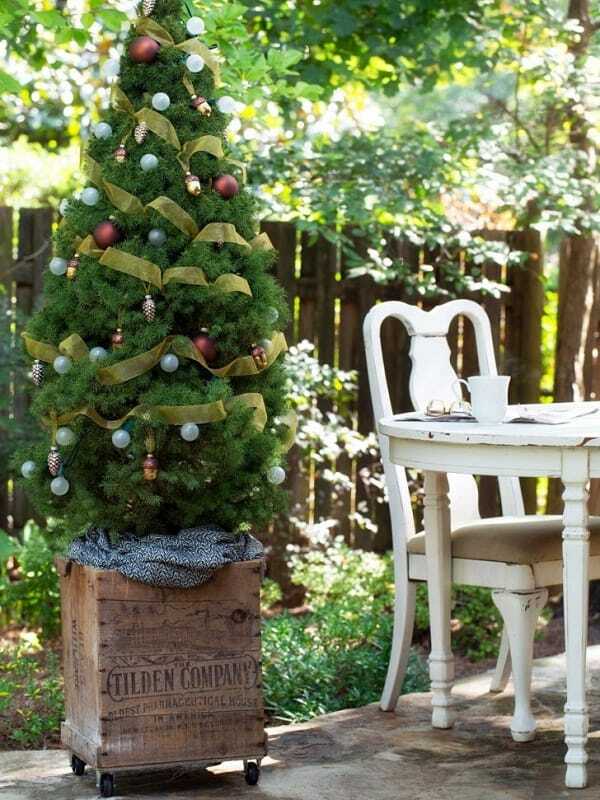 There is nothing new with decorating your garden with a Christmas tree. What makes your decoration special is the theme and the design. Go against the usual outdoor tree decoration and get a wooden crate or trolly or maybe a repurposed wagon, put on the Christmas skirt and decorate your lovely tree. Lighted gift boxes are cute decorations perfect for your garden. Even better, you can actually do it yourself. 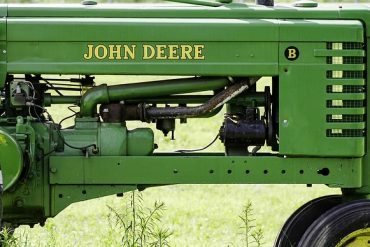 All you need are necessary materials from your local hardware. There are four options to make your very own lighted gift boxes. You may use chicken wire frame if you want something versatile and easy to work with. Best to create the boxes under two feet tall, cover them with whimsical fabric and add some string lights. 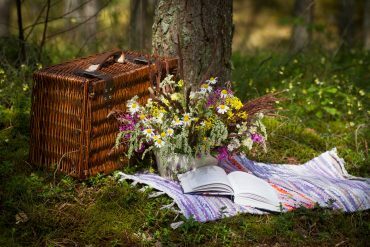 You may also use the wooden frame if you need them to be sturdy so they will not be knocked down by strong wind easily. 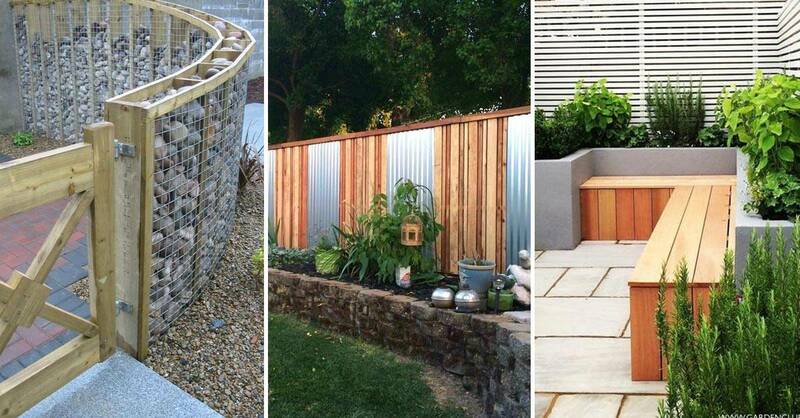 You will need to cover each wooden box with outdoor-rated fabric and add some LED lights. If you like bigger light boxes that are sure to catch the attention of anyone who sees them, go for the PVC frame. The PVC frame will allow you to create 4 ft x 4 ft boxes. Don’t forget those festive fabrics and the string lights to keep the huge boxes glowing. If you cannot find any of the three mentioned above, or if you don’t have much time working on the frames and wrapping them with decorative fabric, you may opt to use the semi-transparent plastic containers. Use some string lights and wrap the boxes with Christmas ribbons, voila! You got yourself some lighted gift boxes that will keep the neighborhood talking. Don’t be afraid to add colors and lights. You are free to decorate your garden so put some Christmas wreaths and red ribbons on your fence. 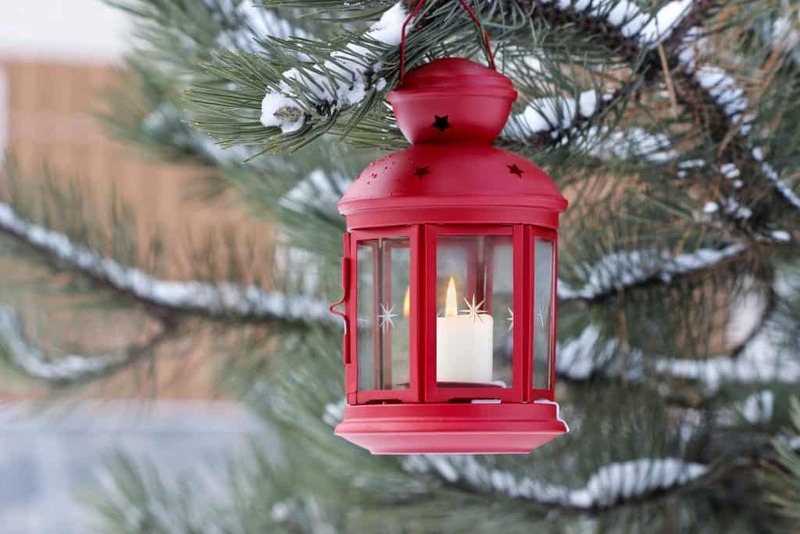 Decorate the trees with glowing Christmas balls and lanterns. Don’t forget the inevitable Christmas colors of silver, green, red, gold, blue and white. 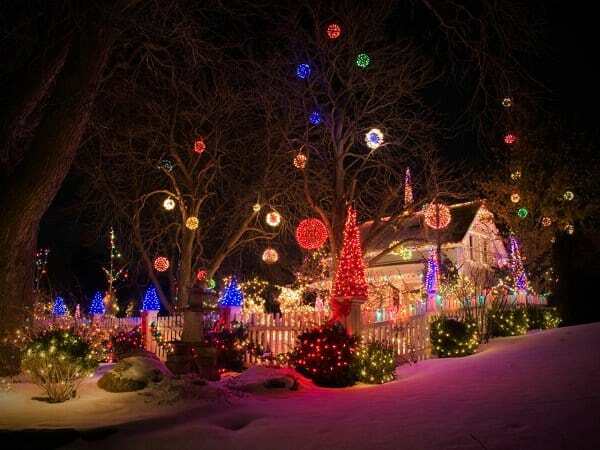 Make your garden look as merry as this holiday should be primarily at night. This one’s easy but it’s perfect for minimalist trying to show your holiday spirit or if you want to use these festive decorations to highlight your garden more. 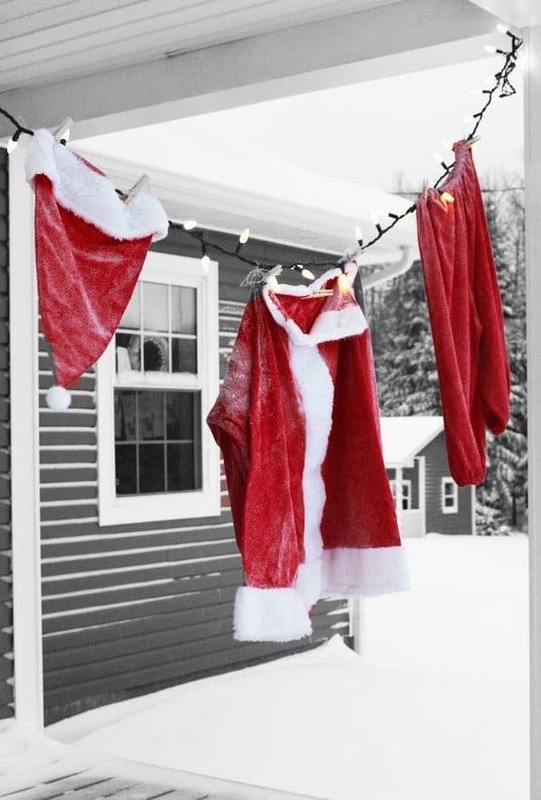 Grab some LED string lights and hang Santa’s clothes, including his hat. Keep those little kids who believe in Santa intrigued! 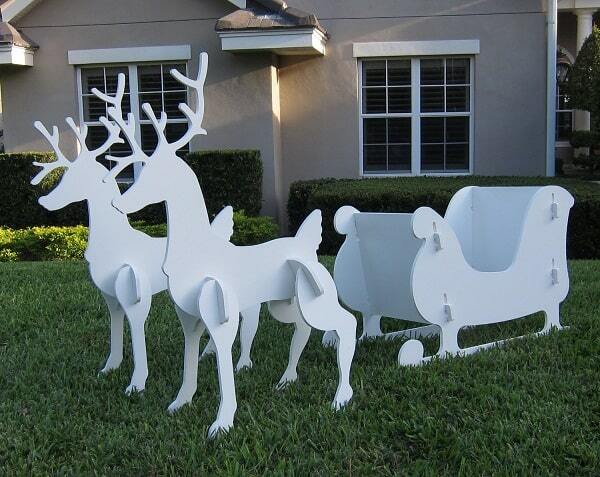 Having a massive garden with more space allows you to add bigger Christmas decoration including these wooden reindeers and the sleigh. You can make your own and have them painted. 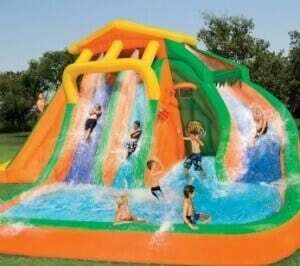 It’s a wonderful decoration for the kids and kids at heart. 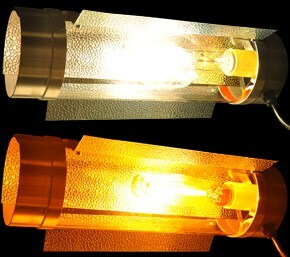 If you are bored with the usual lights and lanterns, you can make your very own stylish lamps. 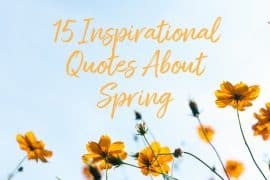 You may put them in the patio, front yard, porch, on the stairs and other areas of the garden. These cute lanterns look good at night. An excellent addition to your garden Christmas decoration if you live in the region where it doesn’t snow. 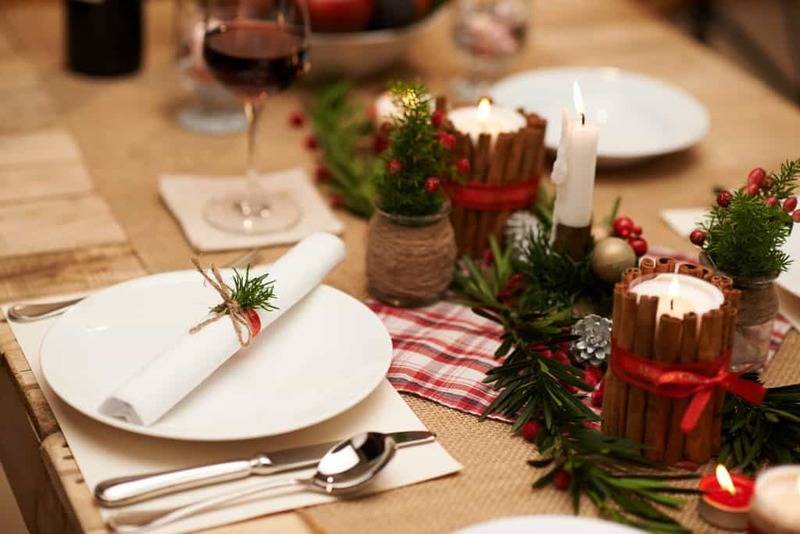 A wooden table with warm elements is perfect. Have a shiny candle holder or just lay down some fresh and fragrant greenery with candles on top. Grab some plywood or similar type of wood, cut in the shape of an arrow and paint them. Label each arrow and be creative with the writing style. 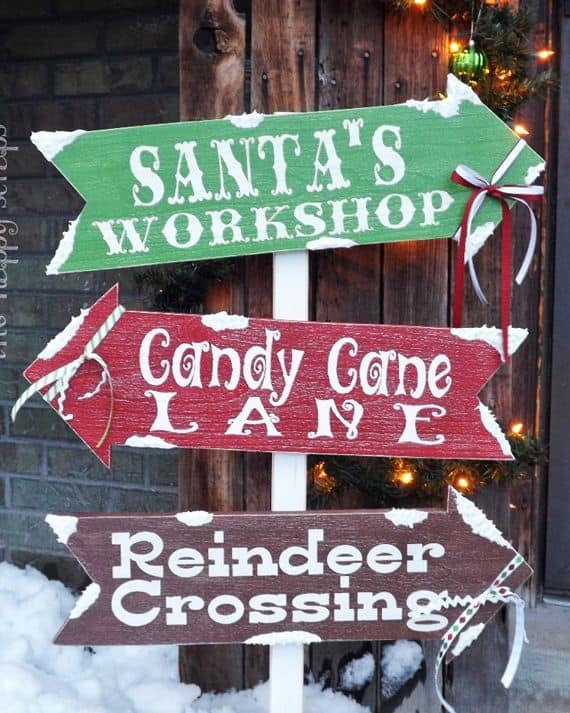 Your garden decoration will look amazing with these arrow signs. 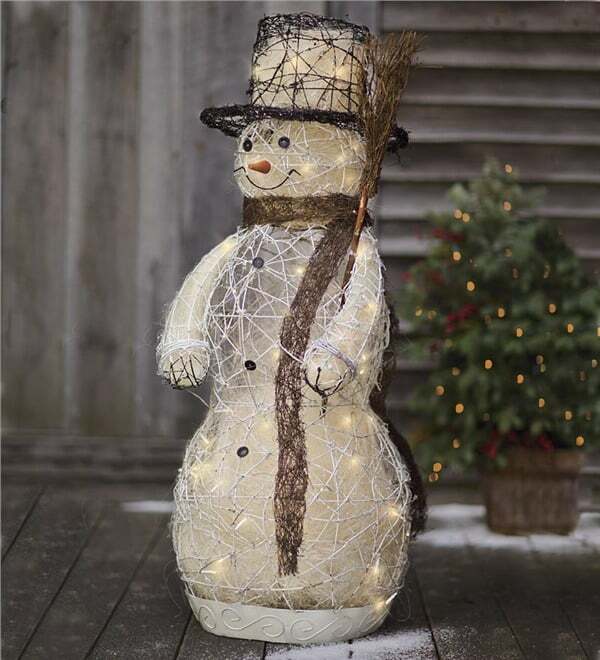 Add some charm into your garden decoration and put in this snowman made from ratan. 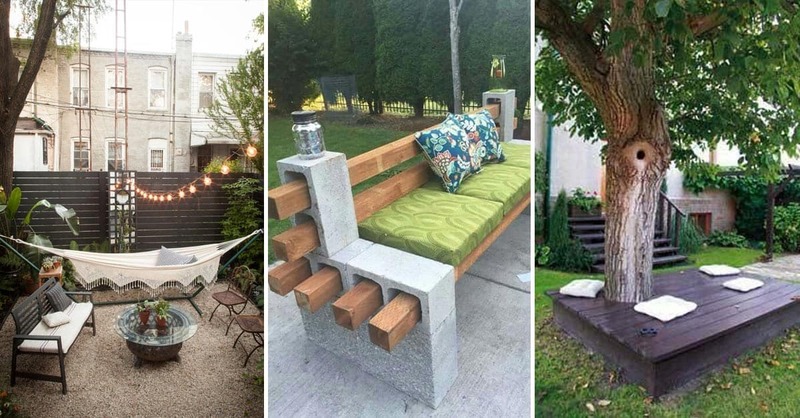 It adds some character into your garden as well. You will surely love how detailed this snowman is made of. Some version of the ratan snowman also come with LED light that will light up its face. Make your own Christmas sign from wood. 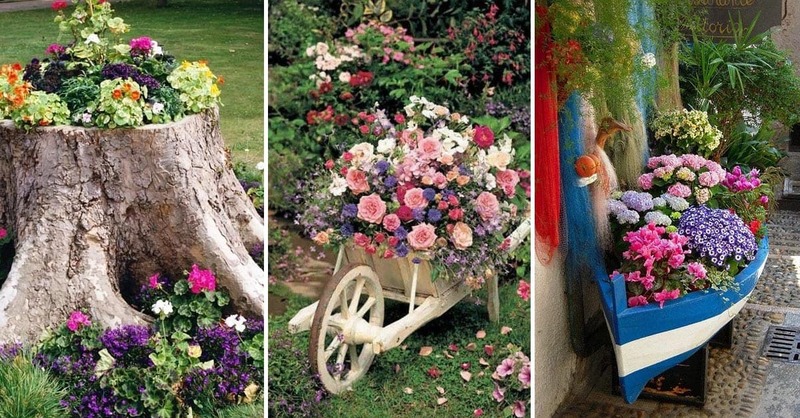 Paint it with color that will match the design and color of your garden theme. Be creative with the message that you want to put in it. You can put in your favorite holiday saying, a short Christmas message or be sweet and humorous about it. 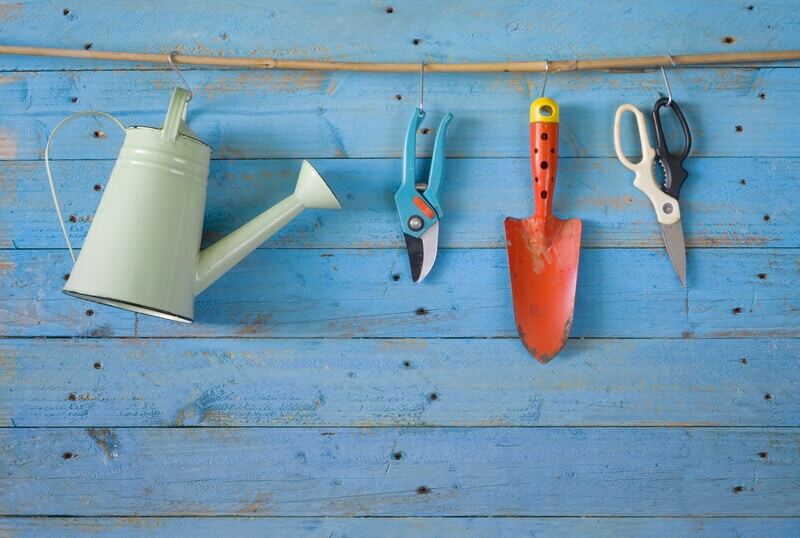 Having a garden to decorate will surely keep you busy this holiday. 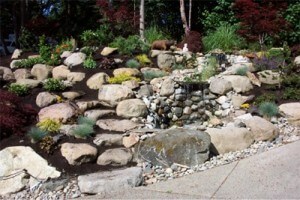 There’s a lot of things you can add to design and bring out the festive spirit in this part of your yard. Stick with your desired Christmas theme and the North Pole will surely have nothing on you.